Balluff is expanding their range of sensors for media-contacting temperature detection, in hydraulic power units for example. New are a temperature sensor with display, a temperature transmitter as well as a PT1000 sensor .The version without display is especially compact and vibration-resistant, whereas the versions with the turnable and highly readable display offers high operating convenience and flexible installation. Continuous monitoring of process media on machines and equipment contributes greatly to process security. Values that need to be maintained are pressure, level and temperature. When for example in a hydraulic system you need to monitor the temperature of the hydraulic fluid, you can do this reliably using our BFT media-contacting temperature sensors. Monitoring the temperature within the hydraulic loop guarantees correct fluid viscosity and thereby the best performance of a machine. 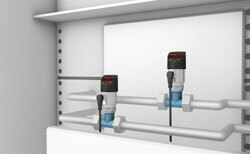 Critical process conditions such as a temperature limit can be controlled directly via the switching output. An analog output provides continuous measurement results. The BFT temperature sensors also stand out when it comes to monitoring the cooling water, lubricants and compressed air, making them ideal for a variety of applications.